She grew up in Xalapa, Veracruz — a shy little girl who played with her brother’s trucks in a city ringed by volcanoes and cloud forest. 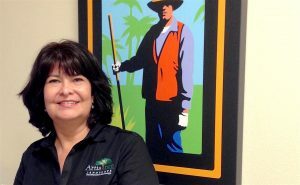 Her brother would become a lawyer, her sister a dentist — and Blanca, the quiet middle child, would become one of the most welcoming faces at ArtisTree, a nationally ranked, $18-million landscape company based in Venice, FL. Blanca Tingley’s career journey began by earning a degree in Accounting and Business Administration from the University of Veracruz. Armed with ambition and extensive English courses, she moved to the U.S. and co-founded with her husband a company specializing in business-debt collection. As their business prospered over the years, she raised two daughters while managing employees and taking every computer course she could to stay abreast of trends. But when the economy took a downturn, Blanca had to look for more work. Two years into her part-time job as an admissions officer for Southwest Florida College, she interviewed at ArtisTree for a human resources assistant position. Her business skills and bilingual abilities made her the ideal candidate, and for Blanca, it would be a “dream job” to flex all her many talents. Today, Blanca is ArtisTree’s Payroll Administrator and is often the first face that job applicants see. From applications and orientations to payroll and insurance processing, she handles virtually any HR duty that requires Spanish translation. “I like to help anywhere I can,” she says. “It doesn’t matter what it is – if I can do it, I do it.” She especially enjoys teaching computer and Spanish skills to fellow colleagues. Her pet peeve? “I don’t like bad moods. I’m an ‘upper.’ I like to make people smile and bring something good to their day.” She goes on to describe how a female Latino contacted ArtisTree several times looking for work but wasn’t qualified to meet current openings. Persistent, the woman finally came in to inquire in person. “I took one look at her and knew right away she needed a job,” said Blanca. “You have to be human to see that real necessity.